With Khalil having barely survived Tobias' brutal attack, Jefferson is on the warpath but finds little help from Deputy Chief Harrison. Meanwhile, Lynn is confronted by her own dark past. Jordan Calloway gets a fantastic final turn as Khalil. As is usual for this show, the music for this episode is fantastic and the music for Khalil and Reverend Holt's deaths scenes are perfectly chosen. Dr. Jace says that she spent some time in the nation of Markovia, working on their metahuman program. In the Batman and the Outsiders comics where she first appeared, Dr. Jace was the Royal Scientist of the Markovian Royal Family and responsible for activating the metagene of Brion Markov, who became the hero GeoForce. The anesthesia Khalil's body produces naturally has gone into overdrive trying to deal with his injuries, making it toxic. Regarding Khalil's treatment, Lynn suggests removing the glands that produce the toxins and trying a different class of anesthesia during the operation. Replacing Khalil's spinal implant, is revealed to be impossible to replace as the techniques used to heal Khalil's spine are far beyond anything the doctor knows modern science to be capable of. Gambi gets a toxin screening done on Reverend Holt's body. It determines he was poisoned. Jennifer's powers allow her to see the electrical impulses inside a person's body. According to her a healthy person's impulses move at a steady, rapid pace. The impulses inside Khalil are dimming and slowing. Todd uses a device to remove the tracking implant from Dr. Jace's ankle and creates a hologram of her reading with a single device. Khalil: Wait... No...I need you to do something for me. Khalil: I need Black Lightning to kill Tobias. Jefferson: ...I can't do that. Khalil: I'll give you everything that you need to take down his operations. I know his routes, his contacts, everything. Jefferson: I won't do that. We have to let the judicial system handle Tobias. Khalil: The system? (breathing heavier, more desperately) You mean the system that let Tobias get away with shooting me and Reverend Holt? The same system that let him rip my spine out of my back? You mean the system that let him get away with murdering your father? Mr. P, is that the system that you're talking about? Huh? Khalil: You promise me...can you make him suffer like me? Jefferson: Yes. (pauses) I'm sorry that I wasn't there for you when you needed me. Khalil: You were always there I just couldn't see you. Woman: Hey, what are you doing on my car? Are you trying to steal it? Woman: You're trying to steal my car! Woman: (turning away, pointedly ignoring Jennifer, using her phone) Hello, 911? Yes, I caught a woman breaking into my car. She's African-American. She threatened me. And she's, like, 5'6". Woman: Oh, my... Oh, my God! What did you do? Jennifer: Your car got hit by lightning. You want to call the police on God? Henderson: What the hell? You got any other dead people around here? Lady Eve? Joey Toledo? Jimmy Hoffa? Henderson: Is this it, man? Anything else? Gambi: Deputy Chief Henderson I faked my death because there were some very serious people after me. And I needed to smoke them out. I asked Jefferson to keep my secret. Henderson: Do you know who tried to kill you? Gambi: No, sir. Not yet. Henderson: And I'm guessing you're not really a tailor, huh? Gambi: No, I am a tailor That's just not all that I do. Henderson: Well, bully for you. Tobias: (gesturing to the minion he just killed) Take care of that for me. Cutter: I don't dispose of bodies. Tobias: Well, I'm expanding your job description. Tobias: Aww, don't go away mad, Deputy Chief. Just go away. Jefferson, Lynn and Jennifer go with Khalil's mother to visit him in the hospital. Khalil asks Jefferson to kill Tobias Whale. He refuses. Khalil offers to give Jefferson his routes and contacts so he can shut down Tobias' operation. Again, Jefferson refuses. Khalil finally asks if Jefferson can make Tobias suffer as much as Khalil has. This, Jefferson agrees to do. Jennifer uses her powers to destroy a racist woman's car after the woman tries to call the cops because Jennifer was standing next to her car while trying to recover from the sight of Khalil. Jefferson puts two and two together later when he hears the woman describing to the skeptical police how her car just got struck by lightning at random. Cutter kills Reverend Holt in the middle of his sermon, without being noticed, using a contact poison through his handkerchief that makes it look like he had a heart attack. Jennifer is unable to stop her hands from glowing after destroying the car. The glow starts spreading up her body as Jefferson finds her and covers her with his jacket. Jefferson tries to drain the extra power out of Jennifer but there is too much. Perrena sensed that Jennifer might need help and shows up at the hospital before Jefferson can call her. Todd finds the video of Lynn slapping Dr. Helga Jace in 205 among the contents of the briefcase. Tobias recognizes Dr. Jace and knows about the scandal that put her in prison. He also notes that she hasn't aged in the 30 years since he first met her. The doctor in charge of Khalil's treatment refuses to let Lynn work with him. Jefferson now knows where Tobias lives. He asks Henderson if they can use Khalil's testimony as the basis for building a case against him. Henderson is agreeable to the idea, but says it has to be air-tight given that happened the last time they tried to arrest Tobias in 204. Jefferson reveals Gambi's secret lair under his shop and the fact that Gambi isn't really dead to Henderson. Henderson agrees to work with Gambi and Jefferson on building a RICO case against Tobias. Jennifer's powers reveal to her that Khalil is dying. Grace shows up at the hospital to bring Anissa some food. Tobias apologizes to Cutter for ending things with her the way he did. She accepts the apology, saying it led to her becoming who she was meant to be. 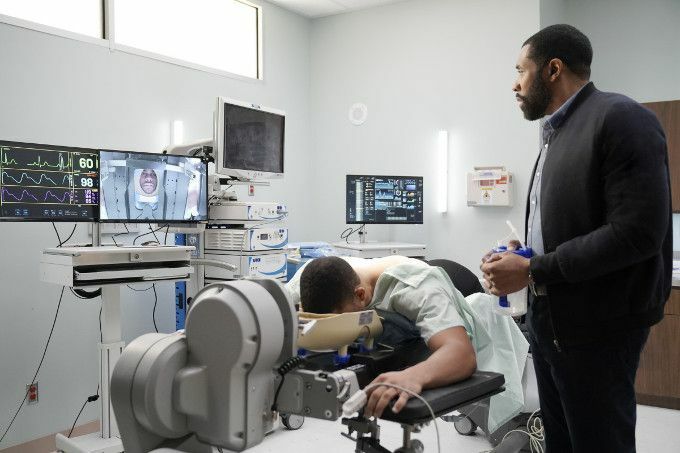 Lynn pulls ran on Khalil's doctor, getting the ASA to help her claim authority to run tests to see if Khalil might be a candidate for being put in a cryo-pod like one of the Green Light Babies until a treatment can be found. Henderson goes to Tobias' loft with a hidden scanner on his tie-pin. This allows Gambi to find a hidden safe. Dr. Jace is revealed to have created the anti-aging serum that keeps Tobias Whale young. Tobias is revealed as one of Dr. Jace's former guinea pigs. Dr. Jace was the original architect behind creating the Green Light vaccine program for the ASA. When it folded, she went to the nation of Markovia to lead their metahuman development program. She later defected with the ASA's help but was jailed shortly after that. Dr. Jace' makes a bargain with Tobias - she'll tell him where to find the ASA's sleeping super soldiers. We don't find out what she wants in return, but it's likely her freedom is part of it. Gambi determines that the briefcase isn't in Tobias' safe. Lynn says they can't use the pods to save Khalil. Using her powers (presumably to manipulate his brain impulses) Jennifer is able to be with Khalil as he dies, bringing him into her safe mental space, which she has reimagined to look like the prom they never got to go to. They get to dance and tell each other they love each other before he fades away. The episode ends with Tobias, Todd, Cutter and Dr. Jace hammering through a wall and into the secret ASA Lab. A powerful episode which kills not one but two long-time supporting characters to tremendous effect. Again, one wonders why this wasn't the mid-season opener given all the sudden shifts to the story and major changes to the status quo. Apart from that oddity, however, this is Black Lightning at its best.